The Palm Canyon Theatre (PCT) of Palm Springs has a long and winning track record of producing musical theatre productions that please their audiences. The list of award-winning productions and Desert Theatre League (DTL) trophies is too numerous to list here. All of their winning efforts have come from the pens of strong librettists and musical composers and lyricists. Most of whom are enshrined in the Pantheon of Broadway Stars and stage productions. “The Wedding Singer,” the stage musical is based on the Adam Sandler movie of the same name that debuted in 1988. The current ‘Wedding Singer’ stage musical now on the Palm Canyon Theatre stage has been updated with a total of 20 musical numbers; some of which are new. The PCT show also retained some the original songs written in 2006. The production is energetically directed by choreographer/director Anthony Nannini, who challenges his ensemble cast and a few principals to deliver his vision of a musical set in 1985. Mr. Nannini has the stage awash in the colorful costumes of resident costumes designer Derik Shopinski, amid a set designed by resident design wizard J.W. Layne, who also is the resident Lighting Designer. So, we’re off to a good start. The story, however, is the weakest component in the production. After all, it was co-written by Sandler for himself to star as the leading man Robbie Hart as a non-conforming, boorish, wedding singer, society misfit who drinks too much and appears to be stuck in a case of arrested development when it comes to common sense. Just the type of role that Sandler loves to play in his movies. Not necessarily the qualities or the stuff that we expect of from our leading men as they search for love and some semblance of stability in life. But alas, we have to root for someone, or we disconnect as an audience. Aaah, to be young, carefree, and fickle. It’s a case of those pesky raging hormones again. Were we really that callow back in 1985? Yeah, I guess we were. In the PCT musical production, Robbie gets a makeover of sorts. The new Robbie played by Shafik Wahhab, is not as off-putting a character as was Mr. Sandler. However, he’s still stuck with some of those questionable character’s traits from the movie. Mr. Wahhab makes the best of the role because he’s a fine actor with a nice tenor voice that sounds great in two-part harmony with his leading lady Julia, winningly played and strongly sung by Elizabeth Schmelling. Their on-stage chemistry works, making the principal supporting players’ jobs easier in keeping this predictable story at least within the zip code of reality and believability. The story, in short, revolves around Robbie Hart, a New Jersey wedding singer, who really wants to be a rock star. He’s the life of the party until his own fiancée leaves him waiting at the alter “shot through the heart”, so to speak. Robbie from then on makes every wedding he sings at as disastrously as he can. Enter Julia, a winsome waitress who wins his affection. As luck would have it, Julia is about to be married to a Wall Street wheeler-dealer and unless Robbie can pull off the performance of a decade, the girl of his dreams will be gone forever. It’s a tried and true old storyline. It’s just like old wine in a new bottle. Most musicals are remembered for their songs. It’s the melodies, and/or the lyrics that hopefully the audiences will whistle or hum on the way out or remember later. With all those singer-dancers up on the stage working hard to please the audience, I can only recall one song that is beautifully rendered. It’s poignantly sung by Mr. Wahhab and Ms. Schmelling at the finale called “Grow Old With You,” written by Mr. Sandler and Tim Herlihy. As lovely as it is, one song does not, however, make for a memorable musical production no matter how hard everyone tries. Also, the off-stage orchestra needs to ratchet down at least two levels so we can hear and appreciate the dialogue and understand the lyrics, as well as reduce the dialogue delivery from warp-speed to something closer to traditional speech patterns. There are twenty-five cast members working hard to please. “The Wedding Singer”, will no doubt, resonate with younger audiences more easily than with their parents and grandparents tastes. Helping to tell “The Wedding Singer” story are: Alisha Bates as Holly; Leslie Benjamin as Angie; Elissa Landi as Rosie; Cameron Merrihew as Glen; Keith T. Nielsen as George; Christian Quevedo as Sammy;, and Tessa Walker as Linda, along with sixteen performers in the ensemble. The orchestra, led by Music Director Jaci Davis on piano features: David Bronson on drums, John Pagels on guitar, and Bill Saitta on Bass. 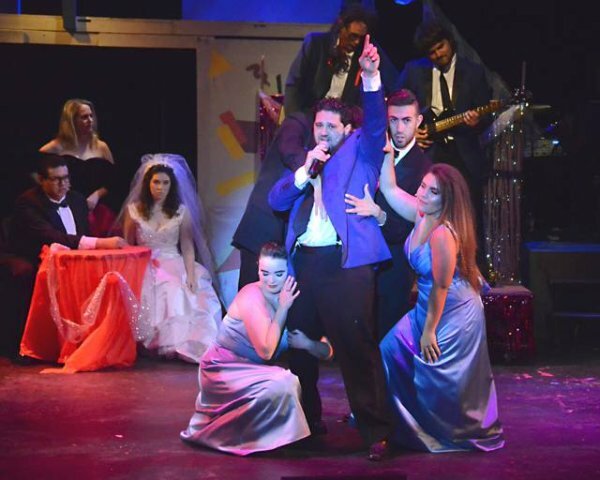 “The Wedding Singer” directed and choreographed by Anthony Nannini, performs at the Palm Canyon Theatre through July 15, 2018. For reservations and ticket information, call 760-323-5123.